Tickets available for purchase between June 18-August 1, 2018 at 11:59 p.m.
Winning raffle ticket will be drawn on Thursday, August 2, 2018. Purchaser does not need to be present to win. Inspiring all girls to be strong, smart, and bold. Girls Inc. of the Greater Capital Region is a (501)c3 organization providing FREE after school and mentoring programs to girls grades K-12. We focus on development of the whole girl. She learns to value herself, take risks, and discover and develop her inherent strengths. The combination of long-lasting mentoring relationships, a pro-girl environment, and research-based programming equips girls to navigate gender, economic, and social barriers, and grow up healthy, educated, and independent. 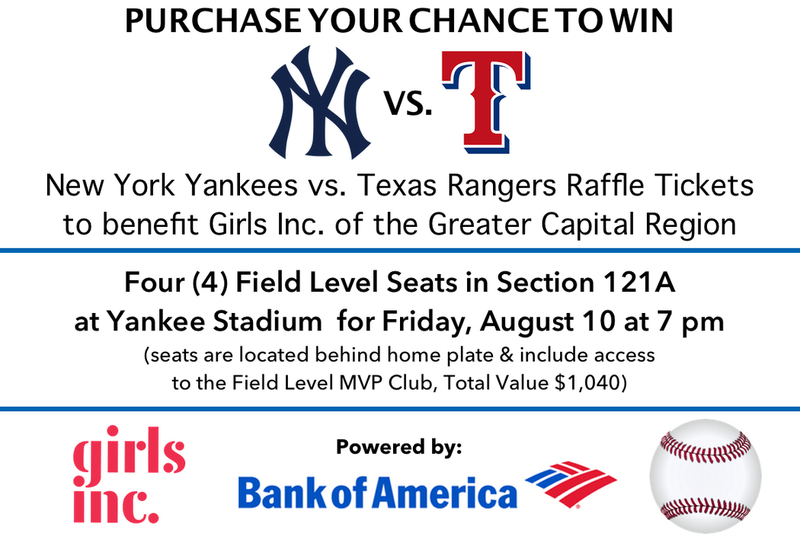 For more information about the raffle or Girls Inc. of the Greater Capital Region, please contact Tina Gleason, Development Director, at (518) 374-9800 x241 or via tgleason@gcr.girls-inc.org.